Be the first to share your favorite memory, photo or story of Rex. This memorial page is dedicated for family, friends and future generations to celebrate the life of their loved one. Rex Combs, age 75, of Russell Springs, KY passed away on April 13, 2019 at the U.K. Medical Center in Lexington, KY. Rex was a member of the Missionary Baptist Church in Russell Springs, KY. He enjoyed spending his time hunting and fishing. He was born on November 27, 1943 to the late Brack Combs and the late Katherine White Combs. He is also preceded in death by one sister and two brothers. 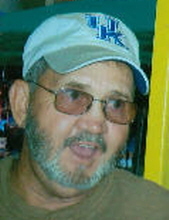 He is survived by his wife: Patricia Caudill Combs; three daughters: Tresea Anderton of Viper, KY, Stephanie Parrish of OH & Earletta Elkins of OH; two sons: Vernon Anderton (Kitty) of Vicco, KY & Charlie Combs of Viper, KY; seven grandchildren; special grandchildren: Brandon Anderton & Brenton Anderton; special dog: Molly and a host of family & friends. To send flowers or a remembrance gift to the family of Rex Combs, please visit our Tribute Store. "Email Address" would like to share the life celebration of Rex Combs. Click on the "link" to go to share a favorite memory or leave a condolence message for the family.